Today, we’re going tell you about something that we absolutely do not recommend you try at home, so we thought we’d get our disclaimer out of the way right off the bat. Do not try this activity. Repeat. Do not try it. Even if we make it look or seem fun, just remember, we told you not to. What on earth are we talking about? Sabering, that’s what. You may recall that we wrote an earlier post in which our friend Stretch demonstrated the art of uncorking champagne with a special sword known as a saber. (Read the post here. Watch the video here.) Actually, to be technical about it, we were sabering sparkling wine, not a French bubbly but rather a crisp, delicious American one produced by the wonderful folks at Amista Vineyards. Being utterly charmed by the swashbuckling allure of the saber, I decided it would make a memorable gift for my Dear Darling for his Big-0 Birthday (not disclosing the number, but it’s somewhere between 49 and 51). As you might imagine, sabers are not easy to find on local retail shelves here in our home turf of Minneapolis/St. Paul. But fortunately, the web offers many options. I settled on a very lovely one from Wine ‘N Gear, which has a store on the town square in Sonoma but also does business on the internet. A note of good wishes from owner Frédérique Mary arrived along with the saber in a mere few days and made the transaction feel much more personal than the typical internet purchase. Housed in a handsome wooden box, I was pleased to find that the gleaming, somewhat-imposing saber has beautiful decorative flourishes and a hand-carved wooden handle. Thankfully, it felt more like a grand, ceremonial treasure than a weapon of war. One really never knows what to expect when ordering a sword over the internet. Made by Laguiole Tradition— a part of the Chateau Laguiole brand based in Thiers, France— the saber is crafted in a style that originated in the town of Laguiole in the early 19th century. 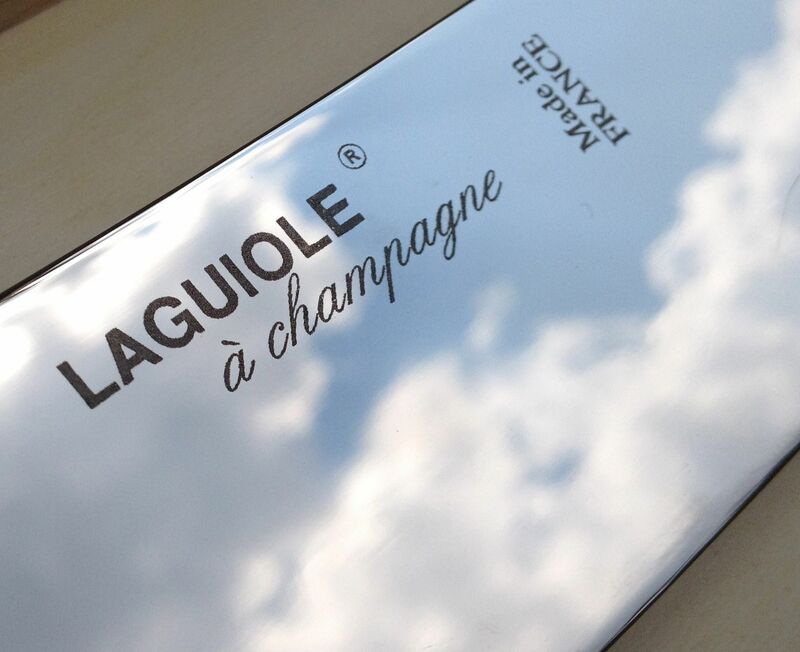 Chateau Laguiole also happens to make gorgeous, fancy corkscrews that many of the world’s top sommeliers reportedly use. 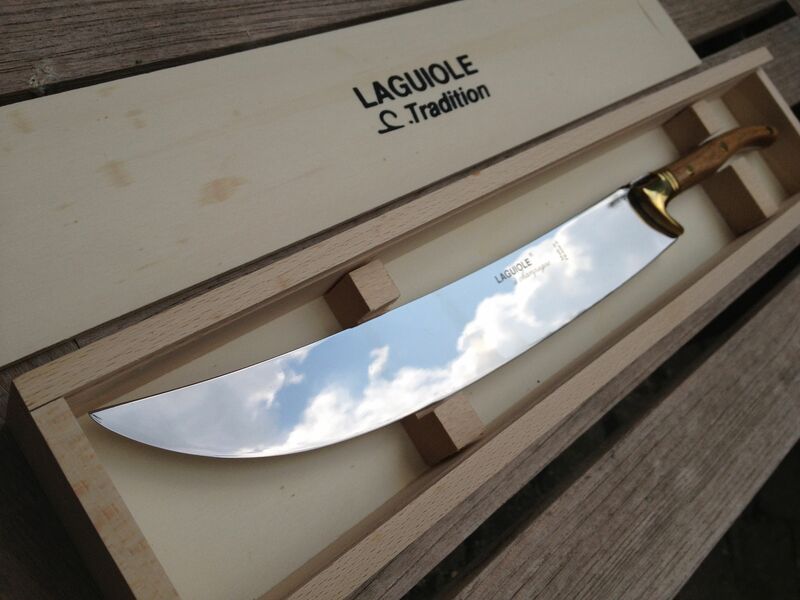 (For those who’d like to know more about Laguiole history and tradition, there’s a great primer on the subject at the blog of a company called De Long which we love for its very handy wine grape varietal table). Big Birthdays merit at least some element of surprise and I was fairly certain my Dear Darling would never expect me to give him a sword. 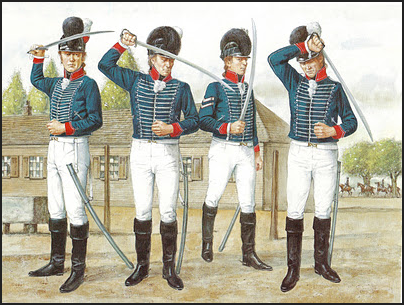 Legend has it that the technique of sabering began with French officers serving under Louis XIV, and later Napoleon, opening champagne on the battlefield to celebrate victories. Napoleon is quoted as having said, “Champagne! In victory one deserves it; in defeat one needs it.” The saber, shorter than a traditional sword, was apparently the favored weapon amongst Napoleon’s light cavalry. We can only imagine the moment on the battlefield when an exuberant French cavalry officer put two and two together, coupling his saber with his champagne bottle to dramatic effect, and thus the practice of sabrage was born. Many people assume that the champagne cork is literally chopped from the bottle with great force when sabering, but this is absolutely not the case. In an article titled Wine 101: The Art of Sabering, Wall Street Journal writer Amy Ma quotes sommelier Sebastian Allano, of Hong Kong’s three-star Michelin restaurant Caprice, as explaining: “It’s the force of something hitting the rim of the bottleneck and the pressure from the bubbles inside.” Ma goes on to note that the size of the blade is of little importance and that even a butter knife can do the trick. (more on this in a moment.) By the way, Ma’s article offers a very good step-by-step on how to saber, in case you decide to ignore our warnings and try it anyway. Knowing that practice makes perfect, I bought quite a few bottles of inexpensive bubbly, upon which Dear Darling could try out his new toy. I was anticipating some early failures. Oh, how little faith I had! When, on his very first attempt, he cleanly sheered off the top of the first bottle on the first whack, I immediately wished I’d bought something more extravagant. However, we were delighted to find that the Spanish Cava that was first on our sabering journey was quite a nice compliment to our evening on our patio. We promise to deliver some tasting notes on our romp through the lower end of the bubbly market once we finish off our practice bottles. To illustrate the point that the tool does not matter as much as the technique in sabering, I wandered through some YouTube videos (there are many) and offer you these sabering variations for your entertainment purposes: with a wine glass, with an axe, with a hand (yes, a simple human hand— wondering about possible trickery here), and with beer bottle and a butter knife. As for our strident warnings against trying this at home, there are many videos out there that demonstrate how badly sabering can go awry. Just search “champagne sabering fail” at YouTube and you’ll see for yourself. However, most of the people in these videos seem to have indulged quite heavily in intoxicating beverages before attempting sabering and it is evident that most if not all did not study proper technique first. So on that note, we’ll toast this week to proper technique, safety and caution, as well as to throwing caution to the wind on occasion. And to big celebrations marked with dramatic ceremony. And to finding humor and fun wherever possible. And, of course, to all of you! Cheers! How fun! The clouds reflecting in the saber makes for a beautiful couple of photos. Cheers! I just had my first opportunity to saber a bottle of bubbly a few weeks ago, just a little instruction on the finer points, and now I want to saber everything! For a fun video, search out iPad saber Champagne on the web, I wouldn’t risk it! Thanks PSsquared! Appreciate the photo compliment, especially coming from you. You have a wonderful eye for catching great photographs. Cheers! We know what you mean about wanting to saber everything once you try it! Cheers. Oh, thank you! You’re too kind. What a great post! I hope to see a demo with the release of your “Thirsty Kitten” wine. Your next label for the ‘kitten’ could be called,”Swashbuckler” with the ‘kitten’ in classic Puss in Boots attire. We’d love to demo for you! It’s not hard to talk us into sabering. Great idea for the Swashbuckler! Cheers! Well done, Dear Drunken Cyclist! We’d expect nothing less from you. Now we’d like to see you try it with your wife’s iPad. Cheers!